Dalat Sky Hostel i Da Lat, Vietnam : Boka nu! 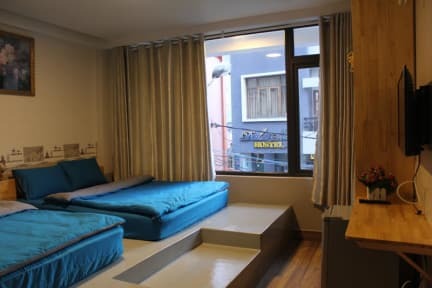 Dalat Sky Hostel Located the heart of Dalat city (near Dalat Market, ATM, pharmacy, bakery, coffee shop, a maze bar…) which has fun, family environment. We have dorm rooms and private rooms which every detail designed and custom built. You will be greeted by super friendly staff and make friend with crazily friendly friends from all over the world in our awesome bar and rooftop lounge. 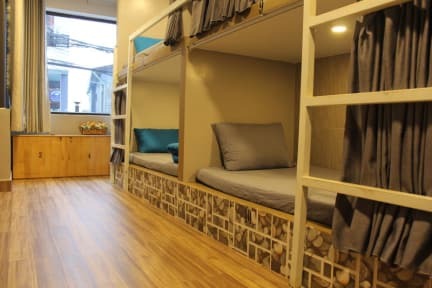 * Private room and dormitory with bathroom inside. * HOT Shower, FREE towel, FREE welcome drink, FREE city map. * FREE and SUPERFAST WIFI in the whole building. * FREE BEER when you arrived. * FREE tea, coffee. FREE local wine from 6pm to 7pm. HAPPY HOUR every day. * Awesome PUB which has good music, tasty foods, cheap beer and cocktails. * Learn how to cook Viet Nam Food or you can join FAMILY DINNER served every day at 6:30 PM. * Dining room with a TV’54 inch and vibrant sound ready for cinema, Sports channel every night. * We also provide secured motorbikes parking if it's required. * Tours for all preferences are available (Canyoning, White rafting, Trekking &Kayaking through the beautiful nature landscapes of Dalat). For your convenience we accept payment by VND, USD, Visa Card and Master Card. 4. At least 24 hours in advance notice for free cancellation. The deposit is non-refundable. 5. Tickets / Tours are available from reception, as well as laundry service, motorbike hired and local information. Great Hostel! Not even joking, kindest staff efter! Daniel n his sister was so fun to hangout with. A great hostel to meet new ppl or just chill. Nice breakfast, love the family dinner, but can also get fast food or go out for street food. The location is really nice, u can walk Dalat in a circel n get back to the hostel. Clean bathroom with hot water n the doorms is cozy. No locker space for your big bags, but security locks. Best stay for the money! Super location close to everything and friendliest staff. Great place with good wifi and breakfast. Very nice staff. But not much other guests during our stay. Have a nice family dinner every night for 75k. Familjärt hostellet! Riktigt Nice men ta med flip-flops! Även om personalen städade mycket var det smutsigt! Jättebra personal, god frukost och hyfsat nära till staden! A good place to spend a few nights. The hostel has a pretty good location close to the centre of town. There where barely any other guests when we stayed here so the score is probably lower than it deserves because of that. They arrange "family-dinner" every day that anyone in the hostel can join for a reasonable price which is nice. We rented a private room that was pretty damp inside and smelled a bit moldy. Nice hot shower though. A lot of the time the reception was empty. Taket var täckt av mögel och kuddarna lika så. Lakanen var inte tvättade och det såg ut som någon hade spillt något riktigt äckligt på dom. Tjejen som jobbade i recessionen var gullig men mannen var rätt otrevlig. Skulle inte rekommendera detta hostel!